Budget-Priced Antique Clocks from Antique Clocks Guy: We bring antique clocks collectors and buyers together. Always the highest quality antique clocks available. 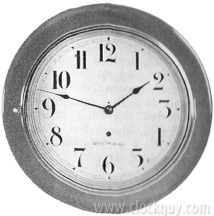 Gallery clocks have always been popular among collectors and those just seeking a simple, but traditional clock for decorator purposes. They were generally used in banks, commercial installations and schools. We're not sure where this one spent most of its life but its condition makes it clear that it led a charmed prior life free of any abuse or harmful environment. Nice! Physical: The Seth Thomas 16" diameter solid oak case is in excellent physical condition and has the original finish. There is a door on the bottom to access the pendulum. The 12" diameter dial is in fabulous condition and has the original paint. Charmed life. Mechanical: The eight-day No. 41A (workhorse) time-only movement is in excellent mechanical condition. We just had it professionally overhauled including two new bushings so it is a great runner you will be able to count on for years to come. Seth Thomas put a dial support board behind the dial on many of its models. Often, lazy repair people did not bother to reinstall it when they finished their service work. But this clock does have the original dial support board (see photo). Comments: Absolutely great clock that will be problem-free and reliable. Also bargain-priced! Please call us to start the process. Give us a call at or send us a note to the e-mail address below and let's discuss the clocks or other items you have to sell. Whether you're a seasoned collector, an estate manager, a "senior" collector looking to downsize in a "pre-estate" direction, or if you're just a beginning collector, we can help you like we've done for many others over many years. Please give us a call or drop us an e-mail note. You'll like the way we work and the way you are treated. Quality, Respect, Responsibility and Reputation are our business guidelines.